UpDog Kombucha is a kombucha microbrewery based out of Winston-Salem, NC. We produce high quality, small-batch kombucha flavored with whole fruits, herbs, and roots. Our kombucha is simple, natural, and delicious, without relying on sneaky ingredients or added sugars. 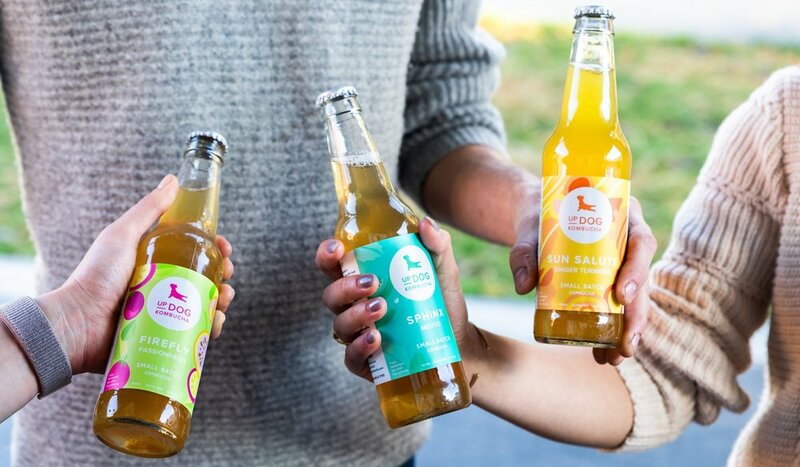 UpDog promises honest kombucha with gut-friendly prebiotics, probiotics, and antioxidants that benefit overall health. Want to try our kombucha? You can find UpDog all over the Triad, North Carolina, and even across state lines into Virginia and South Carolina. Keep an eye out for us on tap and bottled at farmer's markets and your local grocery stores, and yoga studios! Lauren is a recent graduate of Wake Forest University with a degree in Economics. She discovered kombucha after trying some after yoga class years ago and became hooked. In 2016, she decided to start brewing her own and turned her wholesome hobby into a business. Olivia is a recent Wake Forest graduate with a degree in Health and Exercise Science. Her love for tea led her to drink kombucha, and she hasn’t looked back. Olivia's love for local, handcrafted and nutritious products is a passion both in and out of the brewery.